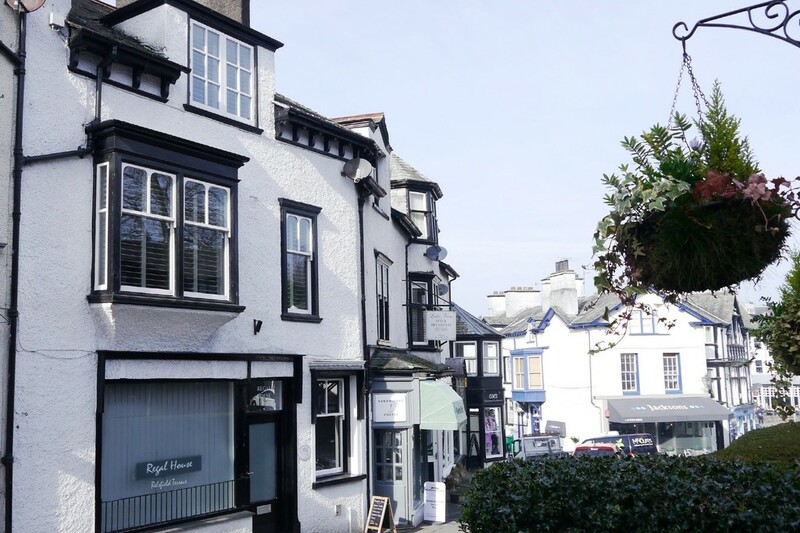 A rare opportunity to purchase a large Edwardian house which has been totally refurbished including new sash windows and Farrow & Ball painted shutters in 2016 and sympathetically and creatively divided into two apartments and a shop unit which is prominently set in the centre of the thriving town of Bowness-on-Windermere. An ideal investment opportunity for someone looking to buy a successful and popular holiday let business which is being sold as a going concern with forward bookings. The house is divided up into two spacious apartments, one which occupies the ground floor and basement level and a second that occupies the first and second floor of this traditional style property and has enviable Lake views from the top floor. The retail/office space is on the ground floor: all with their own separate entrance’s and sharing a communal entrance hallway at the front of the property. 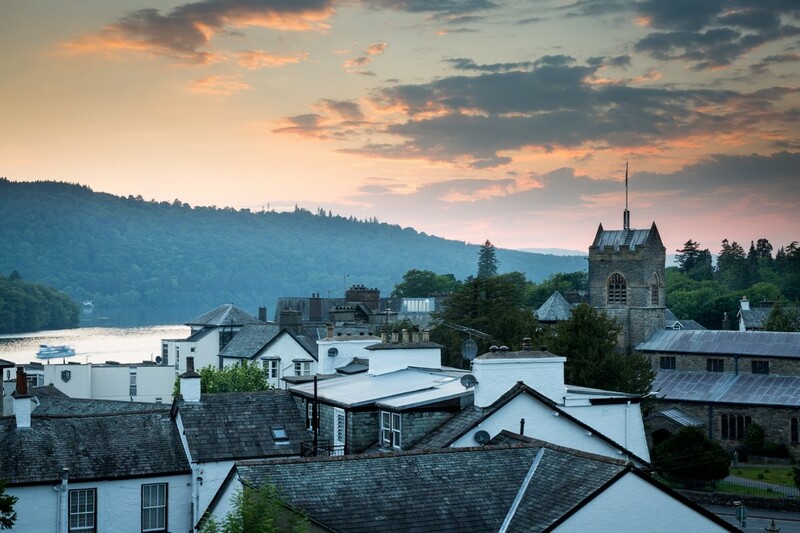 Bowness-on-Windermere is one of the best known villages in the Lake District National Park, which attracts many thousands of visitors over an ever increasing season. 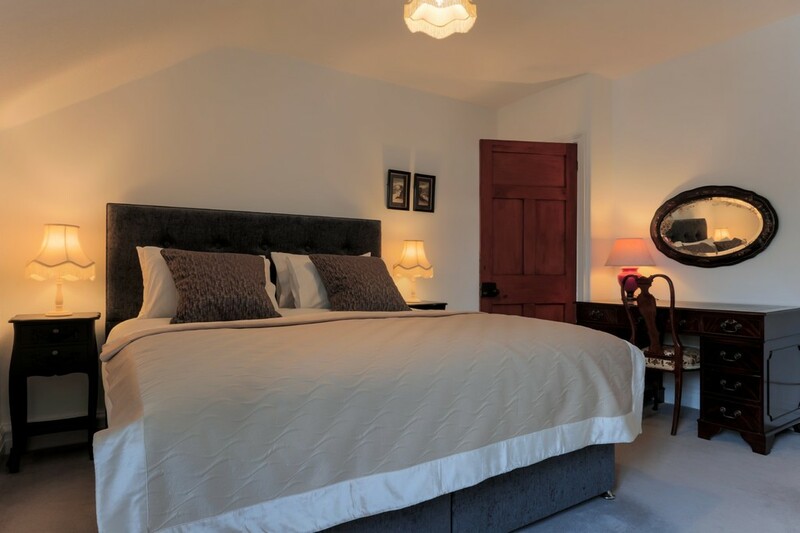 Regal House is only a few minutes’ walk from picturesque Bowness Bay and is ideally suited to provide accommodation for visitors being on one of the main routes into the village. For the seasoned walker the central fells, beloved by Alfred Wainwright provide an excellent variety of challenges. 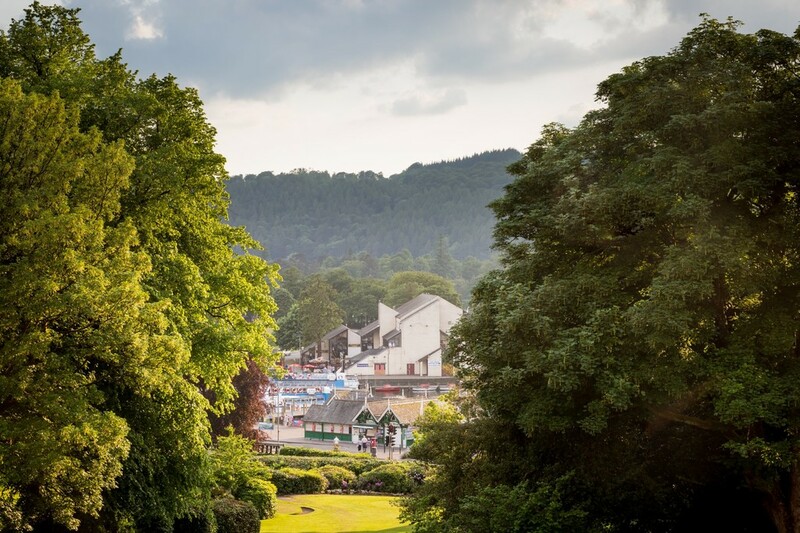 The many lower paths and lakeside walks offer a less energetic alternative to the fell tops while the many local attractions and country houses all add to the visitor experience. Directions From Windermere continue into Bowness village, down Crag Brow and across the mini roundabout. Turn next left into Kendal Road and continue for about 50 yards where Regal House can be found on the right hand side. Accommodation The front door leads into a large entrance hallway with a large crystal chandelier. Retail/Office Unit A good size retail or office space with a large window looking out on to the roadside, currently used as storage. The shop also has a separate WC and sink with a hot water heater over. Traditional high ceiling’s, picture rails and stripped floor boards together with an elegant crystal chandelier make this space a perfect blank canvas to potentially generate a further source of income. 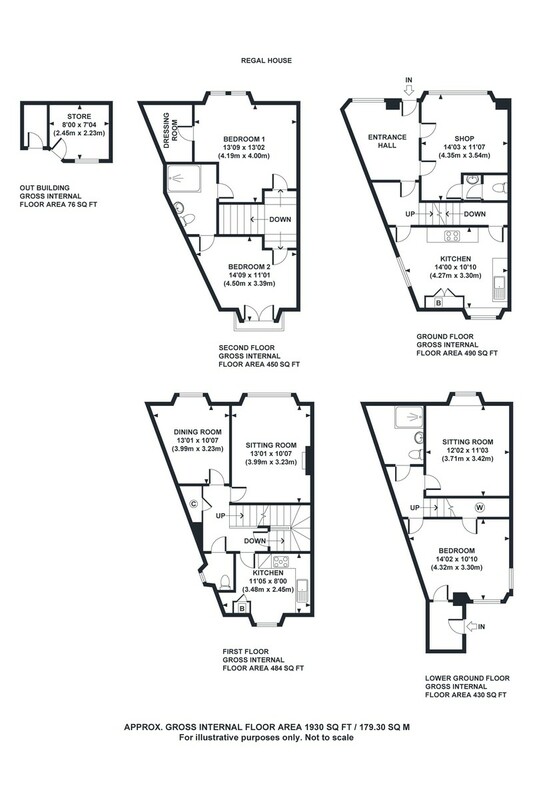 At circa 160ft² we would estimate the market rent to be £5000-£6000 per annum. A doors leads into a inner hallway with the door into "The Courtyard" apartment in front of you and stairs lead up to "The View" apartment. The Courtyard Entering via the communal entrance hall, into a large kitchen/dining space. 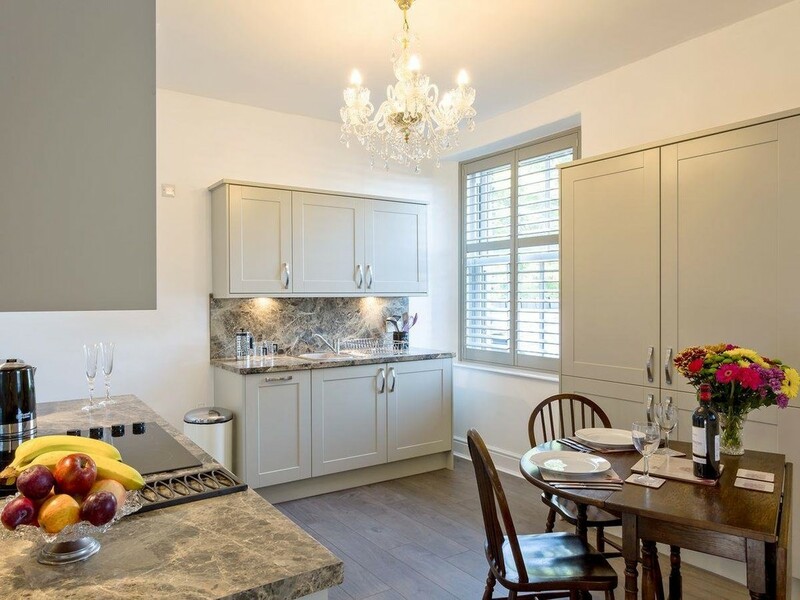 Kitchen/Diner 14′ x 10’10 (4.27m x 3.30m) This is a modern contemporary fitted kitchen with a shaker style kitchen in light olive with a range of base and wall units, complimented with a marble worktop and matching splash backs. Integral appliances including an electric oven, 4 ring hob with an extractor fan over, fridge, washer and slim-line dishwasher. Dual aspect windows look out on to the rear of the property with UPVC sash windows and wooden shutters. Stairs off the kitchen lead downstairs to an inner hallway. Lounge 12’02 x 11’03 (3.71m x 3.42m) A comfortable lounge with a radiator, a beautiful ornate wooden chandelier, TV point and a street level window with obscure glass. Bedroom 14’02 x 10’10 (4.32m x 3.3m) Large double bedroom with a UPVC sash window with wooden shutters looking out into the court yard. There is an under stairs storage area that has a hanging clothes rail and an original fitted shelving unit. There is a UPVC door out of the bedroom that leads out into a porch and onwards to the court yard. Shower Room A superb shower room with modern fixtures and fittings including sunken lighting, under floor heating, large walk in shower with a dual shower head, WC and wash basin. 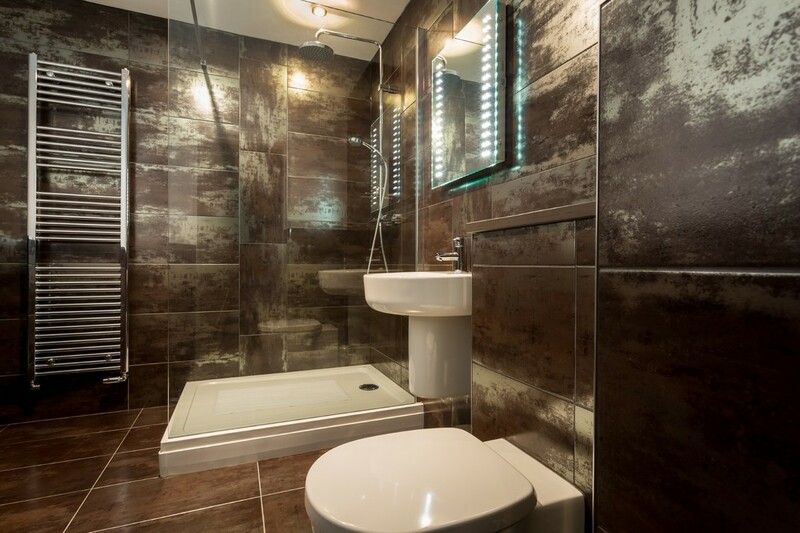 Beautifully tiled in large modern Italian style tiles with matching floor tiles. A steam free mirror with a discrete shaving plug and lighting and a heated towel rail completes the modern look. Porch A handy space for storing coats and muddy boots which has a tiled floor and a UPVC door out into a private court yard. 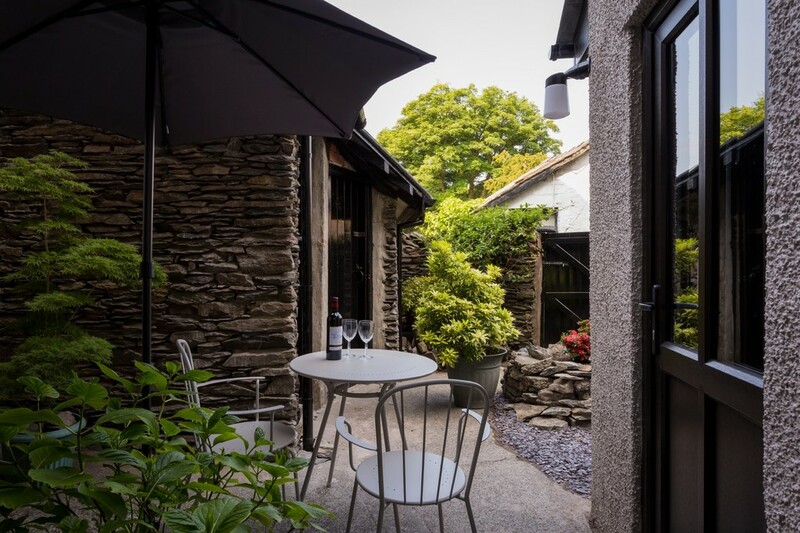 Outside There is a cosy private court yard with Lakeland stone walls and a paved area for seating perfect for enjoying a morning coffee. There is a gravelled area and beautifully planted raise beds. Two Lakeland stone built storage sheds which have recently had a new roof, ideally suited for bike storage. From the ground floor, stairs lead to the first floor and ‘The View’ maisonette apartment. The View Entrance door leads into an inner hallway. Kitchen 11’05 x 8′ (3.48m x 2.45m) This is a modern contemporary fitted kitchen with a shaker style kitchen in light olive with a range of base and wall units, complimented with a marble worktop and matching splash backs. Integral appliances including an electric oven, 4 ring hob with an extractor fan over, fridge, washer dryer and slim-line dishwasher and a radiator. 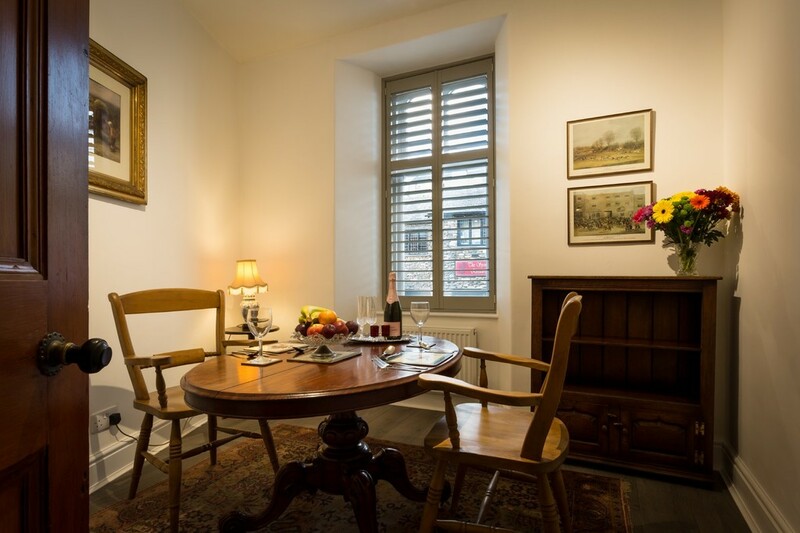 Dining Room 13’01 x 10’07 (3.99m x 3.23m) A lovely light and airy dining space with a radiator, hardwood sash window and wooden shutters overlooking the front of the property. Lounge 11’01 x 10’07 (3.99m x 3.23m) A large space with an original wooden ornate fire surround with a floral tiled hearth and matching inset tiles. 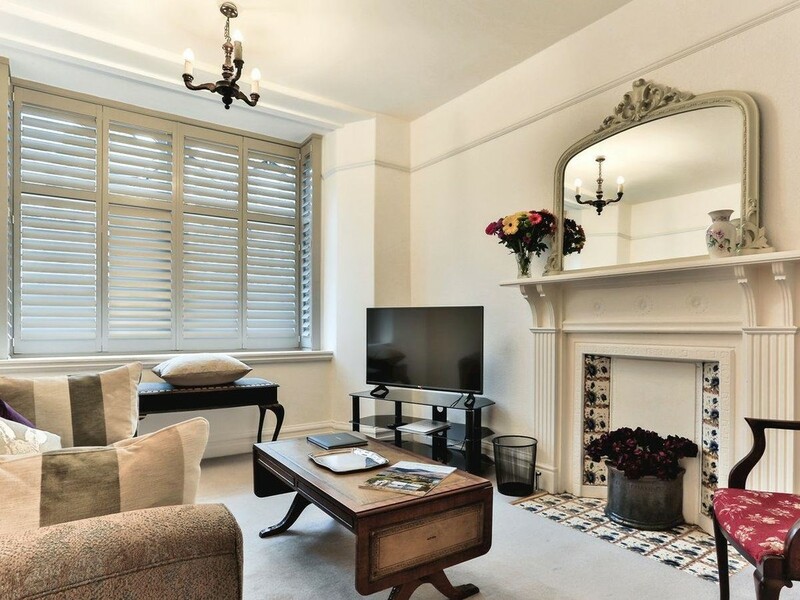 High ceilings, picture rail, TV Point and a large hardwood sash window with wooden shutters at the front of the property. Cloak Cupboard With coat hooks and shelving and a separate WC. Stairs lead out of the inner hallway up to the second floor. Bedroom One 13’09 x 13’02 (4.19m x 4.00m) Large double bedroom with a large hardwood window and wooden shutters over looking the front of the property with a radiator and TV point. There is a large walk in dressing room off the bedroom with a light and radiator. A door leads through to a Jack ‘n’ Jill en-suite shower room. Shower Room A superb shower room with modern fixtures, fittings, under floor heating, and sunken lighting, large walk in shower with a dual shower head, WC and sink. 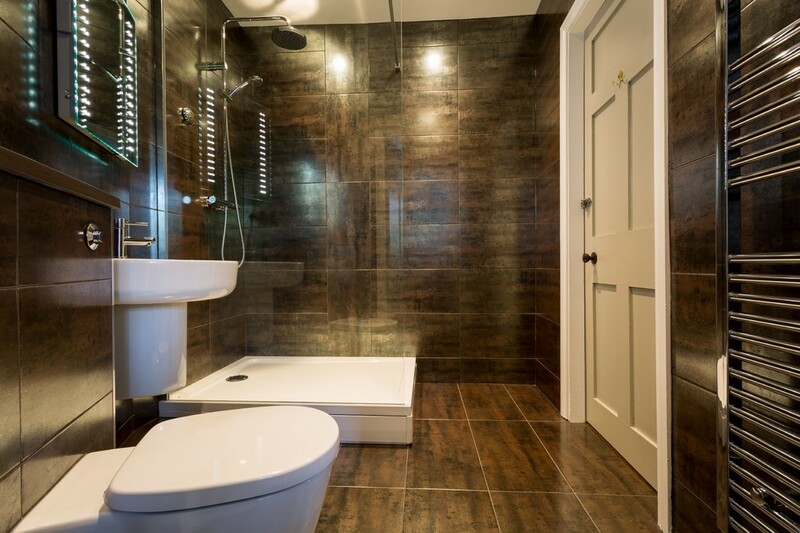 Beautifully tiled in large modern Italian style tiles with matching floor tiles. A steam free mirror with a discrete shaving plug and lighting and a heated towel rail completes the modern look. 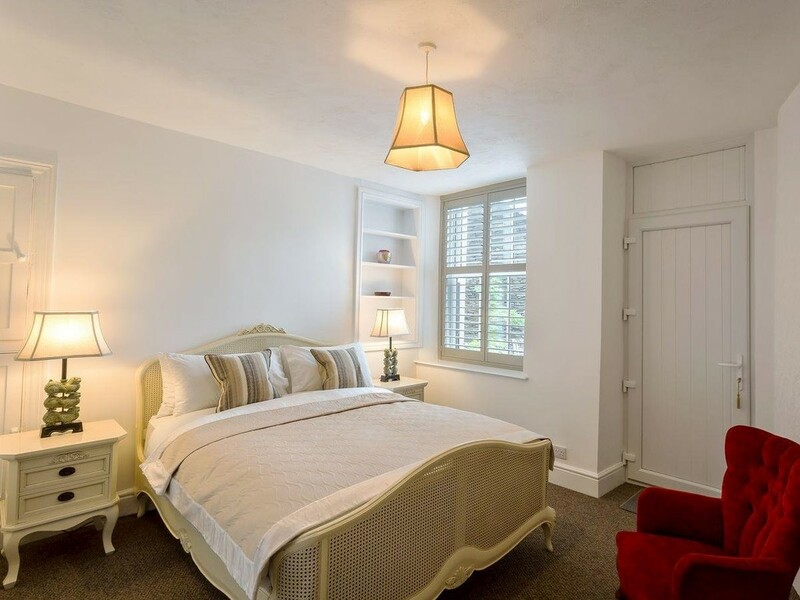 Bedroom Two 14’09 x 11’01 (4.50m x 3.39m) A double bedroom with UPVC french doors which open out onto a Juliette Balcony enjoying wonderful views of Lake Windermere, Claife Heights and the fells beyond. 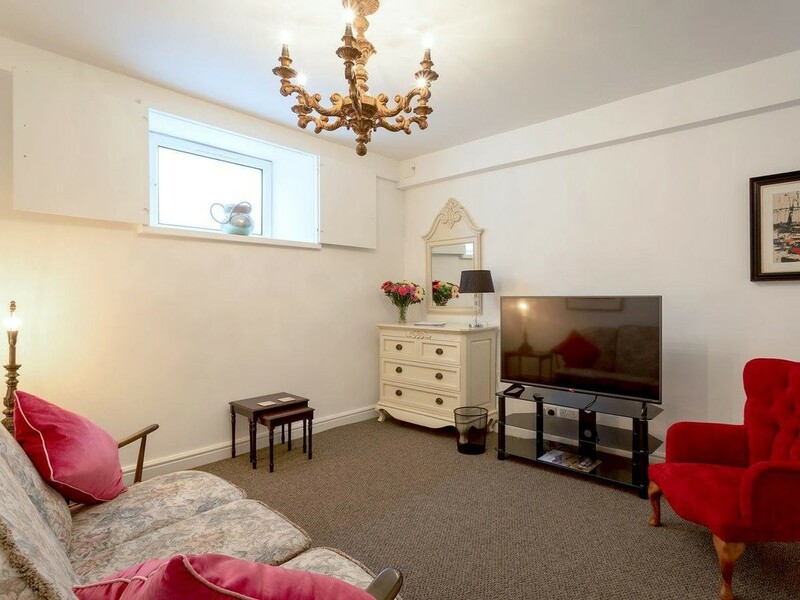 Currently used as a second sitting room, fitted with a radiator and access through into the Jack ‘n’ Jill shared shower room. Services All mains services connected. Each apartment has their own gas central heating boilers. Tenure Freehold. The property is being sold as a going concern, the apartments sold as seen with forward bookings and contents. The retail premises is vacant. Please ask the agent for income details for the holiday let apartments. Business Rates Rateable Value £8200. Benefits from small business rate relief.